Counted as one of the renowned manufacturers and exporters, we are involved in offering a wide array of Premium Cutlery Tray. These trays are widely demanded by various clients for their fine finish, attractive appearance and durable performance. We employ unmatched quality components to manufacture these trays and ensure easy maintenance and long lasting shine. Established in the year 1967, we, "Daulat Ram Janak Raj", are a well-established name, engaged in manufacturing and exporting a wide range of standard quality Kitchen Accessories and Wardrobe Designs. 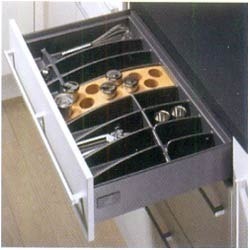 The offered product range includes Modular Kitchen Drawers, Modular Kitchen Accessories and Steel Wires. Our offered products are acknowledged for their impeccable finish, low maintenance and trendy designs. Having emerged as a distinguished name in this industry, we have sustained our strong goodwill by providing international quality kitchen accessories and drawers to our valued clients for over four decades. To come up with utmost quality products is the sole motto of our company and to enable that, we have established a sound infrastructural unit that is equipped with latest machines like welding machines, cutting machines, mill finishing machines and special purpose machines and segregated into different sections like manufacturing unit, quality control unit, warehousing unit and sales & marketing unit. As we are a company which is known for delivering optimum quality, we incorporate optimum quality material and sophisticated technology in our manufacturing process. Moreover, we have established a state-of-the-art warehouse in order to manage the product series wise. Our workspace is effectively managed by a team of professionals to ensure an unparalleled product line. Our reputed clientele boasts of names like Delhi Land & Finance and Sahara India.